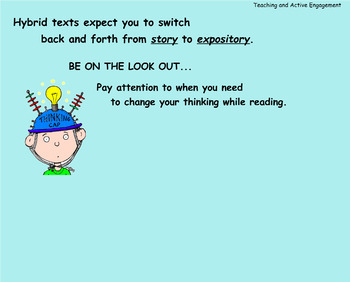 These are SMART Board lessons for Reading Workshop- Reading to Learn:Grasping Main Ideas & Text Structure Unit 2 Lessons 8-17 . It is for the third grade Units of Study by Lucy Calkins and the Teachers College Reading and Writing Project. The lessons will guide you through the following format: Connection, Teaching Point, Teaching, Active Engagement, Link, Mid-Workshop Teaching and Share. 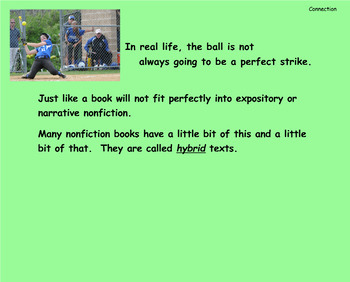 This SMART Board presentation is not meant to replace the TCRWP Calkins' Readers Workshop materials. It is a supplement to guide you through the mini lesson. 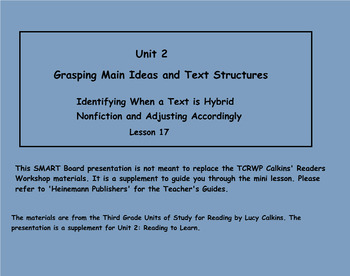 Please refer to 'Heinemann Publishers' for the Teacher's Guides.The SMART Board lessons should be used with the Unit 2 Teaching Manual by Lucy Calkins. These lessons CANNOT be taught without first purchasing the Units of Study. You must have SMART Board software to open this presentation.